While acknowledging the Construction Trilemma, which declares that you can only have your hand on two of three dials – Scope, Quality, and Cost – while making decisions, you can still find yourself puzzling over how to reconcile a project’s budget with its program. When you get to this over-the-budget stalemate, what can you do? Most construction professionals will immediately offer to “value engineer” your project. In most cases, this is a misnomer. What they intend to do is reduce costs by cutting scope and quality. While this works, it ignores the potential of the original process. The practice of value engineering was created General Electric during World War II, when they faced the war-time necessity of doing more with less. GE realized that swapping cheaper materials for traditional ones when making items intended for short life spans resulted in better value. Value was simply the ratio of Function divided by Cost. GE engineers formalized a seven-step reiterative process that optimized Value for every component they produced. Let’s put that concept to the side for a minute and take a high altitude view first. When a project is over budget, the first step should be to determine the severity of the problem by expressing the cost overrun as a percentage of the total budget. If it’s 15% or lower, your chances of reconciling without a great deal of tumult are good. If it’s greater than 15%, success will require a demanding effort. We prefer to view the cost reconciliation process as virtual fundraising. 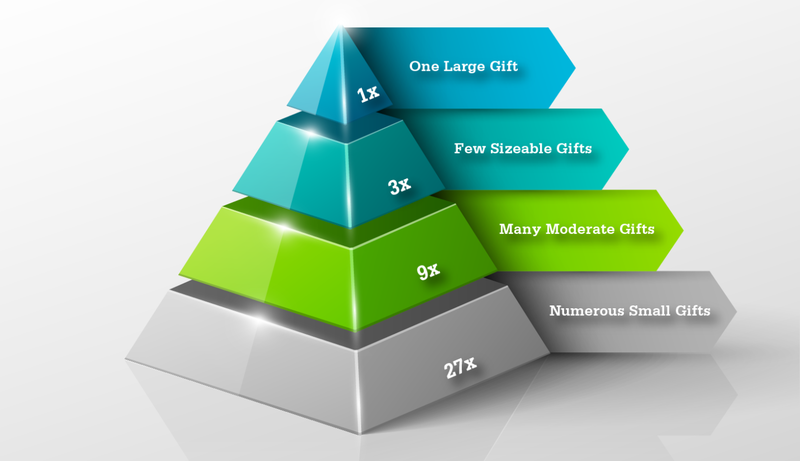 In any fundraising process, mathematical probability suggests the likelihood of a “pyramid” of gifts, illustrated in the image above. A typical campaign will succeed with one large gift, followed by a few sizeable gifts, many moderate gifts, and numerous small gifts. Following the advice of fundraising consultants, you should begin the process by focusing on the large “donors”. They are the keystone contributors that will make or break the process. Unfortunately, they are also the high-hanging fruit that usually requires true “value engineering” to pick. Since a building is a complex manufacturing process with a production run of one, specialty consultants and trades work in parallel, often relying on rules of thumb to avoid conflict and ensure good results. Unfortunately, this process has little incentive for identifying and harvesting economies between different disciplines, leaving them heavily siloed. Consequently, it’s a good place to start looking for major donors. An interactive session, involving consultants from multiple disciplines, can identify opportunities where unharvested synergies exist. The most fertile places to start looking are where Functions in one discipline affect Functions in another discipline. These result in a cascade of savings. For example, if a traditional artificial lighting source was changed to a source that emits less heat (ie LED) and is then operated with a smart control system (ie, occupancy sensors), the cooling capacity of the rooftop unit for the building can be downsized, reducing both its cost and weight. Since the rooftop unit weighs less, the structure can be downsized, possibly even reducing the size of foundations. GE defined Functions with a simple verb-noun combination like “illuminate area”. In the above example of cascading impacts, “illuminate area” affected “cool area” which affected “support equipment”. Since a lighting consultant, focusing only on their specialty, may not have chosen LED sources because they were more expensive, the underlying cascade of savings would have gone unrealized. Seen through the lens of the Construction Trilemma, one ironic turn of the cost dial upward resulted in the scope dial turning downward while the quality dial remained steady. Ultimately, the cost dial then took a dramatic turn downward. We usually set the course for a cost reconciliation process by establishing an arbitrary plan, identifying the major donors and trades they are likely to originate from. Since it’s unreasonable to expect large savings from minor trades, intuition can be a good guide in setting the arbitrary goals. Once the goals are in place, brainstorming can begin on how to recruit the major donors. After major donors have been identified and validated, the arbitrary goals can be adjusted and goals set for the more minor trades. Recruiting many smaller donors, although tedious, can occur under the confidence that success is within reach.